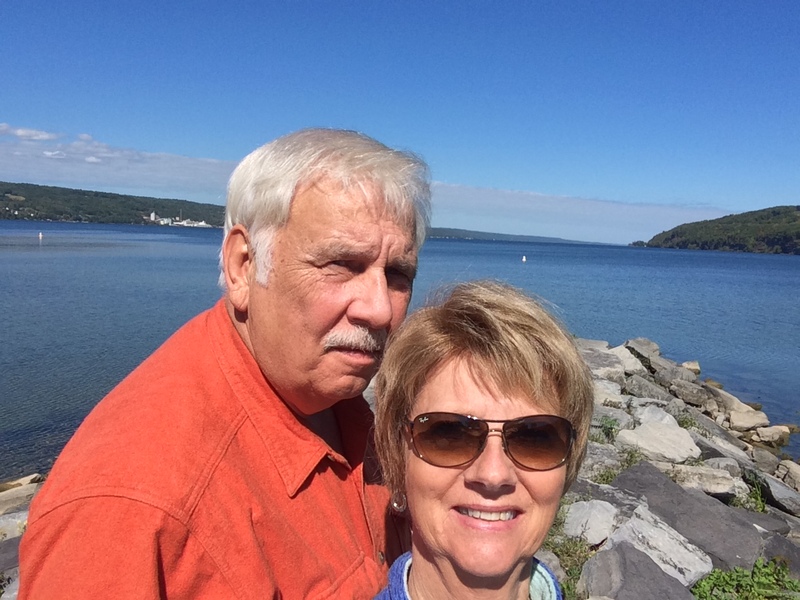 Watkins Glen KOA – Let's Go RVing! After a whirl wind tour of western New York, visiting four state parks and many other things we decided to take today easy. We’ve got two long days of travel ahead so we thought we’d get a little rest. Of course our first stop had to be a return visit to Corning to pick up the pieces we had made and to do a bit of shopping. We ended up visiting another section of the museum, The History of Glass where you could spend an entire day. We also went to the Glass Blowing demonstration again. Jerry could have sat there all day and watched the various artisans create their masterpieces. Afterward we picked up our pumpkin and flower, did a little shopping and headed on out. We went by the campground, picked up our picnic lunch and went into Watkins Glen to the Seneca Lake Park to have our lunch. I went out on the rocks and sat for a few minutes. I think it’s the only time this week that I’ve slowed down and taken a deep breath. There were seagulls all around and Jerry fed quite a few of them. Naturally they hovered around him. We then went down to Watkins Glen and just wandered around the town. We went in a store that had everything you might want from clothes and shoes to ice cream. We each bought a pair of socks that are supposed to keep your feet warm. They’ll be good for those cold football games if they work. We rode through Montour Falls next looking for the water fall which is supposed to be in the center of the town. Actually it was and we accidentally found it. It was very pretty and a nice serene place. A trip to the grocery store and then we went to look at the Watkins Glen International Raceway. Why? So I can tell people when they ask that we did see it! Went back to the campground and sat outside and read while the clothes were washing. Just a nice, quiet afternoon. There is a Country Coach rally going on so all of the campers around us are involved in that so not available for much visiting. After dinner we went to the pool and hot tub for just a very few minutes so we could get back and get the car on the dolly before dark. It was just before dark when we got back but Jerry was still able to get the car on. That will make leaving in the morning much easier.